Chestnut-bellied Sandgrouse: One of the most common sandgrouse in Africa and India. 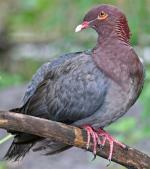 Upperparts are buff to light brown, underparts and face are chestnut, narrow breastband is black. Back and wings are mottled, primaries are darker brown. Tail has elongated central feathers, legs and feet are gray. Mourning Dove: Medium-sized dove with gray-brown upperparts and pink-brown underparts. Eyes are dark with a small, black spot beneath. Bill is dark. Wings are gray-brown with black spots and dark primaries. Tail is long and pointed with black-edged white tips on outer feathers. Swift direct flight. 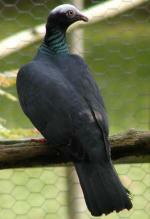 Rock Pigeon: Large, highly variably colored dove; wild form has gray body, dark blue-gray head, neck, breast, and white rump. Wings are gray with two black bars. Tail is gray and rounded with dark terminal band. Forages on ground, eats grass, seeds, grains, clover and berries. Swift direct flight. 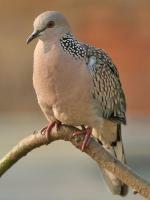 Spotted Dove: Medium dove with gray-brown upperparts and pink-brown underparts. Head has a pale gray cap, dark eye-line, and white-spotted black nape patch. The tail is long and gray with black edges and white corners. Bill is black, legs and feet are pink. Swift direct flight with rapid wing beats. 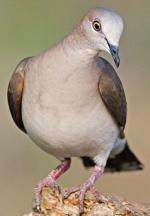 White-winged Dove: Medium-sized, stout dove with gray-brown upperparts, gray underparts, and small, back crescent below eye. The wings are dark gray with broad white stripes. Tail is short and brown with white corners. Bill is gray. Legs and feet are red. Fast direct flight with rapid wing beats. Zebra Dove: Native to Asia. 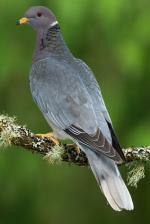 Upperparts are brown-gray with black barring. Underparts pink to buff with fine black and white bars on the sides of the neck, breast, and belly. Outer tail feathers white-edged. Blue-gray face with blue skin around the bill and eye. Pink legs and feet with brown stripes.